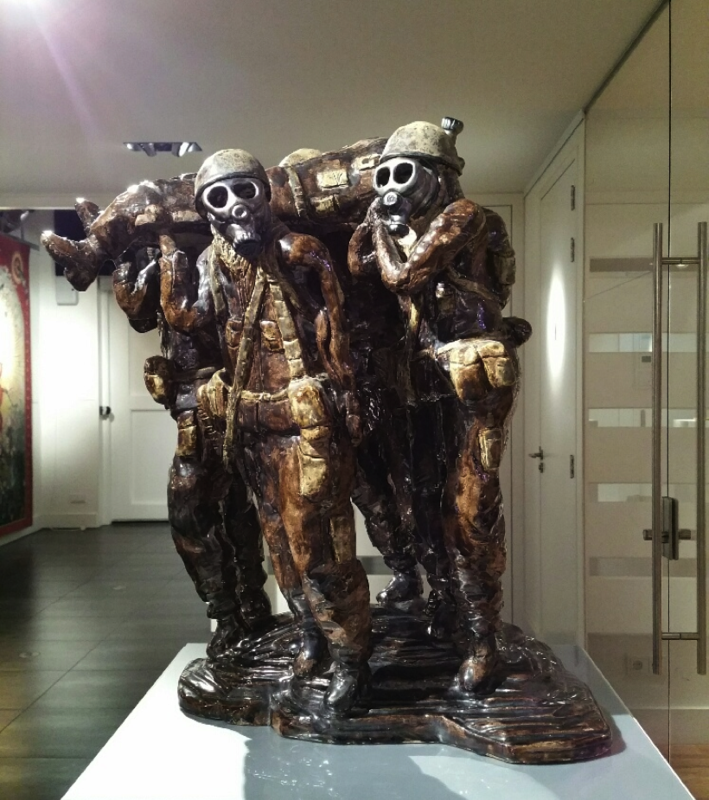 The sculpture Lost in Emptiness by artist Kees de Man is on display at Bergarde Galleries. The image is a group of soldiers during a military training in the Negev Dessert (Israel). They are trained how to survive a poison gas attack together. They carry a stretcher with a wounded soldier on their shoulders. It seems that they want to get him to a first aid post as soon as possible, but all soldiers are looking in different directions. A press photo from 2011 was the startingpoint of the work. De Man envisions a surreal scene in his ceramic: soldiers who are together like brothers, isolated from the civil world and all by themselves in an empty dessert. For De Man, war is alienation, emptiness and meaningless. The fact that the scene is ‘just’ a training excersise emphasizes the macabre appearance of the scene. Lost in Emptiness refers to the big nothing in the dessert that resonated in the by the gas masks covered soldiers’ heads. Kees de Man is ceramic artist. He lives and works in Zwijndrecht. Although he is inspired by the Cobra-artists, contemporary social problems are always important in his work.